Drawing is like any physical exercise it’s often very difficult to start off ‘cold’, we need to warm up otherwise it’s hard to get going and initial drawing attempts can be stiff and lifeless. This activity is a 2 minute drawing warm up. Choose a piece of music, an instrumental piece is better but it’s not essential. I would say pick a piece you like. Take a large piece of paper (wallpaper lining is great for this) and a marker pen. 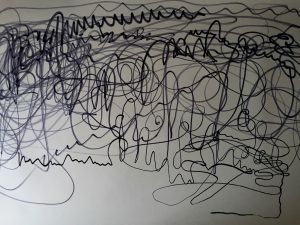 Start to play the music, close your eyes and with the pen make marks (draw) on the paper in response to what you hear and feel. Hold the pen and move your hand and arm freely. As though the pen were a baton. When the piece is finished or a couple of minutes have passed, open your eyes and look at your drawing. Observe the different marks made, the quality, the shape, form and depth of the line. To ‘free up our hand’, learning to draw with the whole arm. The freeing up of the hand creates drawings with energy and life. Not to be too precious about the marks made. If we worry about each mark we make, becoming frightened of making mistakes, the enjoyment is lost and we lose the desire to experiment and explore. To tune into other senses, in this case the sense of hearing. Using more than our sense of sight, can heighten our sensitivities and feeling towards a subject. Try this exercise again with different pieces of music and medium. Listen to the music first, then consider which medium you might use to best illustrate the piece. Have a go holding the pen in your non dominant hand. Hold a pen in each hand or even try a different medium in each hand. When the music plays move both hands/arms.